Following popular events like Winter Wonderland in Hyde Park, Terrain Aeration has been helping the ground recover in London's Royal Parks. Under contract to White Horse Contractors, Terrain spent three weeks treating compaction caused by the weight of ice on turf, compounded by thousands of people skating on top of it. As part of Winter Wonderland in Hyde Park a temporary ice rink was in action from the first week of December to the beginning of January. Having treated the turf and subsoil to one-metre deep compressed air de-compaction at two metre spacings, Terrain Aeration injected dried, milled seaweed to keep the newly created underground fractures and fissures open before back filling the probe holes with lytag and turning their attention to Green Park. Armed with two Airforce Scamper Terralift machines and the original Airforce, and under contract to Enterprise the company set about relieving compaction caused by temporary buildings and generator lorry parking needed for the Afghan Conference Media Centre. Andy Grover Project Manager for Enterprise said, "we have a policy to keep the parks looking their absolute best in the summer for the benefit of the thousands of visitors from both London and further afield, and to do that we need to attend to all our maintenance in early spring. Terrain Aeration was here in St. James' last year and we've employed them again to treat a large heavily trafficked area in Green Park, as well as the other two sites." Terrain's M.D. David Green says that although the work has taken longer than planned he's gratified to see the difference in drainage. "The amount of snow and rain that has fallen this year slowed us down for a while but I was pleased to see that an area of mud that we treated in Hyde Park had dried rapidly and was still without surface water despite a further 75 mm of rainfall during one weekend," he remembers. 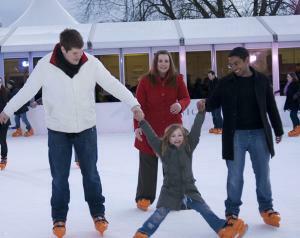 Caption Photo 1: Winter Wonderland in Hyde Park. 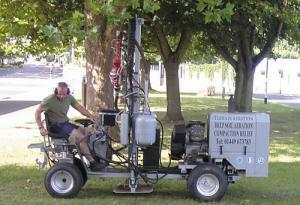 Caption Photo 2: Terrain Aeration's Airforce Terralift machine.